Reactive hypoglycemia is a condition in which the body reacts to a perceived catastrophic drop in blood sugar. I say perceived because during an episode, the blood sugar readings may be in the normal range, but still "feel" like low blood sugar to the person having the reaction. In my experience, hypoglycemia happens to most people when first beginning a low carb, ketogenic diet. It may be especially strong in people who have already developed insulin resistance or pre-diabetes from a chronic excess of carbohydrate intake. There are different types of low blood sugar causes. Transient hypoglycemia normally happens when most people who have been eating a high carb diet drastically reduce carbohydrate intake for the first time. This type happens during the first several weeks of carb reduction because the body has not had time to create the enzymes or metabolic state to burn internal fat stores for fuel. Basically there is a gap in the amount of carbohydrate available for fuel, and the process of accessing fat stores for fuel. The lack of fuel sources results in transient low blood sugar. Reactive hypoglycemia is more of an acute reaction to a very high carb meal. For instance, when a person eats 2 or 3 glazed donuts, there is a huge spike in blood sugar and compensating insulin secretion after such a meal. The large insulin spike drives blood sugar very low several hours after the meal. Insulin, a hormone, is secreted from the pancreas in response to eating food, especially foods high in carbohydrates. Its main job is to move the blood sugar your body creates from the food you eat into your cells so that it can be broken down for energy or stored. Insulin is a very powerful hormone, and it acts very quickly. The amount of insulin your body secretes is closely tied to how much blood sugar is being created from your food intake. Eating a high carbohydrate diet over a long period of time will cause a chronic elevation of your blood sugar, which will then result in a chronic elevation of your blood insulin levels. A high level of insulin in the blood is associated with inflammation and obesity, mainly because when insulin levels are elevated, fat storage is increased, and burning stored fat for fuel is inhibited. It’s a sort of vicious circle - the more carbohydrate eaten, the higher the insulin, the less stored fat can be accessed to fuel the body, so more carbohydrate has to be eaten to provide fuel instead. One of the benefits of eating a ketogenic diet is its ability to lower your average blood sugar and insulin levels, and allow the body to burn stored fat. However, when first starting the diet, your body might still be in high-carbohydrate, high-insulin mode. As you lower your carbohydrate intake over time, you begin a process of retraining your body to burn stored fat instead of carbohydrates for fuel. Normally, it takes from 1-3 weeks for the body to adjust the new lower level of carbohydrate intake, and build the enzymes needed to burn stored fat as a primary fuel. Meanwhile, during this adjustment phase, your pancreas is still secreting enough insulin for the older, higher level of carbohydrate consumption. And because blood insulin levels are high, the body is dependent on carbohydrate for fuel, since stored fat can't be accessed. Your body hums along with less carb intake for a couple of days because it can tap into the stored carb (glycogen) in your liver. But eventually, the glycogen stores get low, more insulin is secreted than actually needed, and a couple of hours later, you have a severe episode of hypoglycemia, aka low blood sugar. Your body perceives that your blood glucose is too low, and starts evasive tactics to get the sugar it needs for your brain and red blood cells from somewhere. Your body increases it's adrenalin (epinephrine) output to tell the liver to break down stored glycogen or amino acids into glucose FAST and dump it in the blood stream, while the nervous systems pumps out acetylcholine, a neurotransmitter which acts on the sweat glands, causing profuse sweating. Eating 1-2 glucose tablets are an easier and faster way to relieve the symptoms. 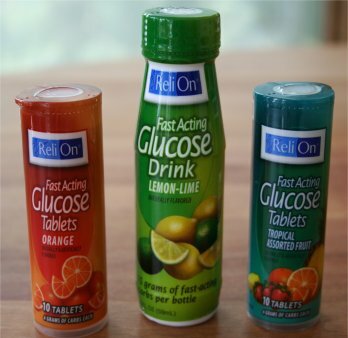 When beginning a ketogenic diet, I highly recommend buying some glucose tablets or glucose drinks like the ones in the picture and carrying them around with you. They are available at most stores in the diabetic supplies section. In addition, my friend Luke, who loves rock climbing, swears by a product called SuperStarch by UCAN. He says it has helped him get past some hypoglycemic episodes when he started a keto diet. He says the product is marketed as a gluten free sports drink, and supplies sodium and potassium as well as carbohydrate to help with low blood sugar. He writes "It has really saved my bacon more than once and allows me to stay on my ketogenic diet with confidence." I have never used Superstarch, but Dr. Peter Attia at the Eating Academy blog uses this product as well and he's pretty savvy about ketogenic diets and exercise. In the short term, when first starting a low carb diet, eating more frequently may help. Long term, the best way to avoid reactive hypoglycemia is to permanently reduce the amount of carbohydrate that you eat on a daily basis. This will eventually lower your baseline blood sugar and circulating insulin. Once insulin returns to normal levels, your body can then access its fat stores, and quickly switch over to burning fat for fuel when you go without a meal or two. During the first phases of eating a lower carb, ketogenic diet, it’s a good idea to make sure you eat every 3-4 hours. Until you can retrain your body to burn fat, don’t try to go for more than 4 hours without food. Paradoxically, some people who experience chronic hypoglycemic reactions report that waiting 5-6 hours before the next meal actually helps reduce the reactions. Be aware that mainstream physicians aren’t generally knowledgeable about this condition because it is rooted in nutritional causes. Doctors aren’t taught about the power of nutrition, and so he or she may minimize your concerns about it. But if you having these reactions, it indicates you are becoming insulin resistant, and that can mean you are on a path to diabetes, even if your fasting blood sugar is normal. You may have to reduce your carbohydrate consumption slowly over a longer period of time to minimize these reactions, but eventually, by continuing to consume a diet lower in high carb foods, you should be able to avoid reactive hypoglycemia completely.